Most fish sold in pet- and aquarium stores come from tropical regions and require a heated aquarium. If you’re interested in setting up an unheated aquarium, though, you may be surprised to hear which popular “tropical” fish are actually sub-tropical and appreciate lower temperatures! Keep reading for a list of easy aquarium fish that don’t need a heater. White cloud mountain minnows (video below!) are very popular aquarium fish often sold to beginning aquarists as tropical. Although these fish do naturally experience seasonal fluctuations and warmer summers, they actually prefer a temperature between 60-72 °F or 15-22 °C. This means you can keep them without a heater and even outside if you live in a warmer area. Their smaller and lesser known cousin, the Vietnamese mountain minnow (Tanichthys micagemmae), prefers slightly warmer temperatures between 64.5-71.5 °F or 18-22 °C. Mountain minnow habitat is quite easy to imitate, something these fish will really appreciate. In the wild, they occur in shallow streams with a low to moderate flow and possibly some vegetation. In the aquarium, you can keep a group of at least 6 (preferably more) in a rectangular aquarium of at least 23.5″/60cm (larger is better). A dark sandy substrate with smooth pebbles as well as a relatively strong filter flow and some stem plants would be ideal, although they should do well in regular aquarium setups. A full white cloud mountain minnow caresheet can be found here. Paradise fish (pictured at the top) are a beautifully colored, feisty species that naturally occurs in some parts of Asia. Like the popular betta, they are a labyrinth fish (Anabantoid), meaning they possess a labyrinth organ that allows them to breathe air. Unlike many other labyrinth fish they are actually subtropical and can tolerate a temperature anywhere between 50-71.5 °F/10-22 °C. If you’re interested in keeping paradise fish, keep in mind that the males are very territorial and shouldn’t be kept with other males: a trio of one male and two females works best. A tank of at least 31.5″/80cm with plenty of cover in the form of normal plants, floating plants and driftwood is recommended. Paradise fish actually naturally occur alongside white cloud mountain minnows (discussed above) and can be kept with this peaceful schooling species in your aquarium as well! 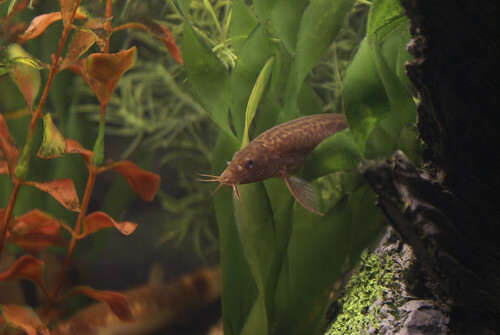 Although they’re often sold as algae eaters or plecos suitable for normal aquariums, hillstream loaches like Beaufortia kweichowensis are actually entirely different fish that naturally occur in very fast-flowing waters. In the aquarium it’s best to imitate their natural habitat. Without fast-flowing, cooler water between 61-75 °F/16-24 °C oxygen levels will often be too low for them. A strong filter and additional circulation pump(s) are definitely a good idea if you want to keep these fish! A group of at least five should do well in an aquarium of at least 31.5″/80cm. To further imitate these hillstream loaches’ natural habitat and provide them with the biofilm they feed on, use strong lighting and smooth rocks to promote (green) algae growth. Many of the crayfish often kept in aquariums can withstand a very wide range of temperatures. For example, the popular Procambarus alleni will survive in anything between 57-80.5 °F or 14-27 °C. Larger crayfish species are very aggressive and require an escape proof, single species setup of at least around 23.5″/60cm. Despite this, they are a favorite among many aquarists for their funny behavior and tendency to “rescape” their own tank by moving things around. Dwarf crayfish species from the Cambarellus genus can also be kept at room temperature and are, as the name suggest, much smaller than their big cousins. They are also known to be much less aggressive and more suitable for community aquariums, so if you’re not ready to set up a single species tank these may be a better choice for you. A tank of at least around 15.5″/40cm with plenty of hiding places is a good start! A full dwarf crayfish caresheet can be found here, while information about various different crayfish species that you’ll love can be found here. Cherry shrimp are a small dwarf shrimp variety appreciated for their red color and very easy care. They are a great beginner shrimp and will do well in pretty much any temperature. Between 57-86 °F/14-30° C is usually recommended, but they’re known to survive far lower as well. This means a heater is not necessary. Cherry shrimp should be kept in groups of at least five and can be introduced in pretty much any cycled aquarium, although a tank of at least 5 gallons (18L) with plenty of cover is a good place to start. These shrimp breed very quickly, so unless tankmates with a taste for fry are present you should soon see your colony growing. Excess shrimp can be sold, used as live food or just left in the tank: their bioload is so low they don’t pose too much of a risk of overstocking. A full Cherry shrimp caresheet can be found here. Goldfish are probably the most popular subtropical fish kept in aquariums. Unfortunately this often results in bad care, as common goldfish are actually only suitable for ponds and fancy goldfish require a lot of care. Although they occur in many different interesting varieties, have great personalities and can be kept in unheated tanks (preferably between 62-71 °F/17-22 °C), getting into fancy goldfish keeping is not something to take lightly. These fish grow very large and need at least 20 gallons (75L, preferably more) per fish, with a minimum of two fish. Filtration should be very heavy and weekly large water changes are required. More information about why goldfish can’t be kept in bowls can be found here. A full common (single-tailed) goldfish caresheet can be found here. A full fancy goldfish caresheet can be found here. Weather loaches are a large loach species named after their ability to detect storms and displaying a strong reaction to weather changes. They are a great fish for larger, unheated and escape proof aquarium setups of at least 47″/120cm. A temperature between 59-75 °F/15-24 °C is considered ideal for these loaches, although they are also said to tolerate lower for some time. I often see aquarists keep their loaches on (sharp) gravel, but this is not a good idea. Many loach species, including this one, naturally spend a portion of their time burrowing and appreciate a fine sandy substrate that doesn’t hurt their bellies. Also be sure to provide plenty of additional hiding places. 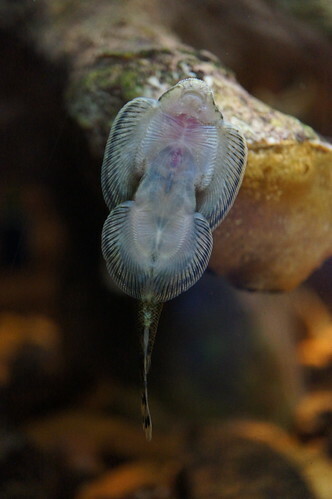 Like most loaches, weather loaches like to spend a portion of the day in a dark place and don’t come out until evening. When discussing coldwater aquarium fish there’s no way we can leave zebra Danios off the list. These small schooling fish are a longtime aquarium favorite, not in the least due to their ability to withstand low temperatures. Danios don’t just make a great addition to your coldwater aquarium due to their temperature tolerance. They’re also fantastic little fish in general. Peaceful, active and beautiful colored, a school of this small species will look great in anything from a single-species biotope set-up to a ‘regular’ community tank. Keep your Danios in a long (vertical) aquarium of at least around 20 gallons. Although they’re pretty small they are definitely active swimmers and will really appreciate having plenty of room. 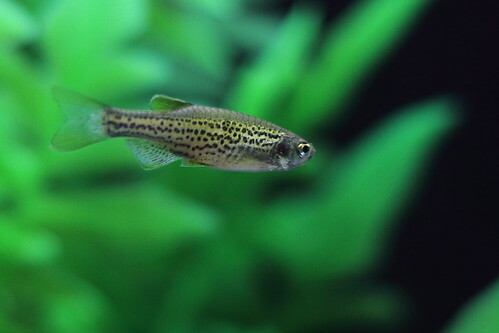 Go for the spotted leopard Danio if you want something other than regular old zebra print. You can find everything you need to know about keeping zebra Danios in the Danio caresheet here. Although they’re actually relatively readily available in many aquarium stores, it seems Rhinogobius duospilus are not commonly kept fish. A pity, because they’re actually a fascinating species, suitable for small aquariums and quite interesting to watch. 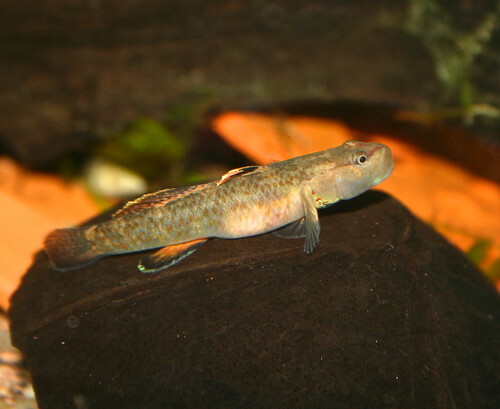 Gobies from the Rhinogobius genus are naturally found in China and Vietnam, where they inhabit shallow and fast-flowing streams and rivers. In the aquarium they make a great choice for unheated hillstream set-ups. A large tank is not needed: with a maximum size of around 4 cm/1.5″, Rhinogobius duospilus does well in set-ups of around 15 gallons/57L and up. Temperature-wise the species is pretty variable, with a minimum of around 60 °F/16 °C and a maximum of up to 79 °F/26 °C, although it’s probably better stick with something a little lower. Keep your Rhinogobius with other fish that appreciate cool temperatures and hillstream-type environments. Peaceful small schooling fish like white cloud mountain minnows (discussed at the top of this article) should work well. Don’t forget to set up a live food colony (such as blackworms), as these gobies don’t respond that well to commercial pellet foods. This list of easy coldwater species is by no means exhaustive. Other subtropical fish you should be able to find in your aquarium store include species like peppered Corydoras and rosy barbs. If you’re looking for more information about setting up an unheated aquarium and the fish on this list or if you want to share your own experiences, don’t hesitate to leave a comment below. Happy fishkeeping! Not to mention how much money you save from a coldwater aquarium. If you have a lot of plants your lighting bill might get high @ 8 hours a day, but compared to lighting and filters heaters use a ton of electricity. Cold water aquariums are a good way to solve this. Hello! Great to hear you’re going about this the right way doing your research and cycling properly. Goldfish wouldn’t be a great option anyway as they need tons of space so it’s good that you’re looking into other fish. My personal choice if I ever were to set up a coldwater tank would be to go the full hillstream route with super strong flow, rounded algae-covered river rocks and Beaufortia loaches. An awesome opportunity to set up a biotope tank. If that’s not your think then the paradise fish would have my preference. You can combine them with the lovely, active and colorful white cloud minnow and they might also mix alright with dwarf crayfish. I now have the least killifish, perhaps 25-30, hard to tell with the plants in a 16h, many of them babies/fry, and of course in an inside unheated aquarium. 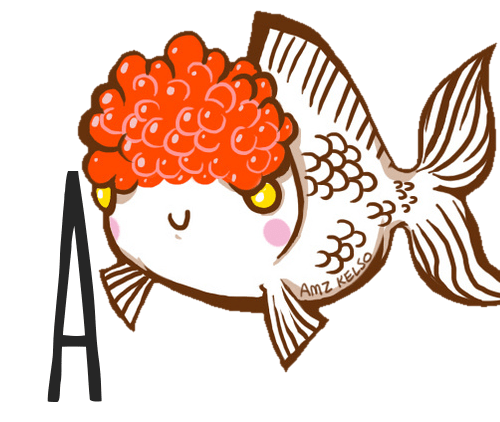 A delightful, easy to keep fish! Thanks for sharing! They do sound like great little fish. I have a tank with white cloud minnows and zebra danios living together – not actually something I planned for, but I adopted an unwanted goldfish and was given two minnows and a danio along with her – and then of course i had to get friends for the poor lonely things. I have a pretty decent filter current and a bunch of plants in the tank and both species have thrived, but I have found that I need to have a 2:1 ratio of white clouds to danios. The danios are pushy fish and were crowding the white clouds out a bit, but giving the minnows the extra numbers seems to have given them the confidence to hold their own. It’s super interesting to hear that paradise fish can live with white clouds! I would be dead keen on doing that when I upgrade their tank size next, but the catch would be the danios. I’m thinking perhaps the danios having those bold blue stripes and being less shy fish might mean the possibility of a clash. Hi! I think you’re right when it comes to combining paradise fish with danios. They are known for being a lot more ‘assertive’ than most schooling fish and can definitely become nippy or cause conflict with the paradise fish. I don’t know what kind of tank the danios and white clouds are in right now, but if it’s an option maybe you could move the white clouds to a new setup with paradise fish and build a new stock around the danios in the old tank? Keeping white clouds and paradise fish together does sound great, so I hope you can make it work 🙂 be sure to keep me updated! Now I’m curious, I have an aquarium with white clouds and zebra danios … i wouldn’t consider adding more fish right now, but if at some point in the future when I upgrade their tank size I fancied adding a few paradise fish… do you think they’d be ok with danios? I’ll interpret that as a “no” then I’ve been told a bigger fish “probably won’t catch them” before when I had these guys in with my goldfish and I ended up with disappearing fish! Wouldn’t want them stressed by having to evade the paradise fish all the time either. Thanks for the info! I have 4 tanks, all “subtropical” ie., unheated in the home. Temps can run from a low of 64F to above 80F. I have white clouds, bloodfin tetras, black skirt tetras, and generic platys. I have had fathead minnows, love them, and dojo loaches before I realized how much room they need. The fatheads and rosyreds are not native but are now wild everywhere here as is the dojo loach, which ends up in all the irrigation ditches eventually. I love the unheated tank possibilities and pine for other fish, the least killifish and Florida flagfish among many. This was a great post, thanks.